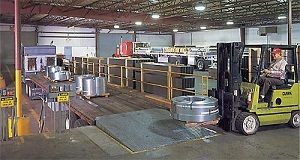 ﻿ Cardinal Manufacturing Company - Regional JIT, Flexible Scheduling and Warehousing Services. The quality of Cardinal Manufacturing's packaging is parallel to the quality of our parts. Instead of tossing parts into one or two pre-sized boxes, we can build custom, sturdy, wooden boxes around customer-specified box quantities and part-stacking orientation. You can rest assured knowing your parts are being shipped in solid, sturdy packaging made to fit. Our spacious warehouse and indoor docking facilities permit us to schedule manufacturing to suit our customers' needs.